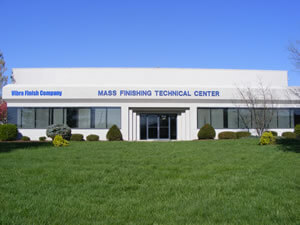 Vibra Finish Company started in 1975 in Vernon, California as a small distributor in the mass finishing industry. Thru hard work and customer service we have grown to become a leading manufacture and global exporter in the industry. We offer a complete line of ceramic, plastic, and synthetic vibratory tumbling media and compounds and high energy vibratory equipment under the VibraHone trade name. Our manufacturing and warehouse facilities are located in California, Ohio, Kentucky and China. The California, Ohio and Kentucky facilities alone total over 130,000 square feet and warehouse over a million pounds of inventory. Whatever your mass finishing needs may be, you can be assured of one thing, the most experienced and trusted name in mass finishing media, compounds, and equipment is guaranteed to be Vibra Finish Company.